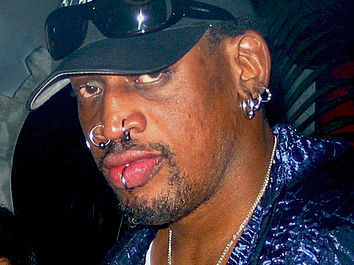 Basketball bad boy Dennis Rodman (a.k.a. The Worm) and three other Harlem Globetrotters have landed in Pyongyang for what must be one of the most bizarrely concocted diplomatic efforts in history: “basketball diplomacy” in North Korea. Picture this: Rodman, a 6-feet-7-inch monument to individualism – pierced, tattooed, often sporting multihued hair and flamboyant outfits – shaking hands with Kim Jong-un, the son of the late “Dear Leader” Kim Jong-il, who rules a country where fashion is largely limited to military khakis and facial hair is outlawed. At first glance, the encounter beggars belief. Then again, considering VICE television is behind the effort, not much should come as a surprise. Affiliated with New York City-based VICE magazine, VICE television will air the show on HBO in early April. Rodman was mobbed by reporters as soon as he arrived in Pyongyang on Tuesday. Using this trip as a way to open doors to the world outside may seem like a long shot. But if anything is near and dear to Kim Jong-un’s heart, it is basketball. Rodman, who arrived in Pyongyang just two weeks after North Korea defied the UN by conducting an underground nuclear test, comes on the heels of another high profile visit. In January, Google’s executive chairman Eric Schmidt made a surprise trip to tour Pyongyang computer labs and meet with officials. Schmidt’s trip came just weeks after the DPRK sent a satellite into orbit on the back of long-range rocket. While Pyongyang announced that the nuclear test was meant to send a message to Washington, the North Korean government claimed the satellite launch was for space exploration. Some fear the real intention is to build a small nuclear bomb that can be sent to the U.S. on a missile. In short, tensions remain high, even while Rodman plays in pick-up games. Most reports focus on Rodman, now 51, slam dunking in Pyongyang pick-up games. Yet, there is another very interesting point to address here: A few years ago VICE produced a highly critical documentary on North Korea titled The Vice Guide to North Korea. The one-hour film is anything but tame. It features scenes of North Korean labor camps in Russia, visits to the state-run Korean Feature Film Studio near Pyongyang and more. VICE has also run an expose on North Korea’s perilous amusement parks. “Given the highly critical coverage of the DPRK that (Vice Founder) Shane Smith and Vice reporter Alex Hoban have doled out over the last several years, the fact that they let Smith back in may be an even bigger story than Dennis Rodman,” said Noland who writes for the Peterson Institute’s blog North Korea: Witness to Transformation. Indeed, this engagement does speak to a gradual opening of the country. While it is not revolutionary at the level of government relations, cultural exchange may gradually soften perceptions about Westerners among ordinary North Koreans who may come in contact with them in some form. “North Korea has become more and more comfortable with foreigners visiting over the last decade and this kind of interaction fits in with that. It’s not something they really see as a threat anymore,” Andray Abrahamian, Executive Director of the Choson Exchange, a Singaporean NGO that focuses on business development for young North Koreans, told The Diplomat. While it is undeniable that the DPRK is slowly warming up to the presence of foreign faces, on a more fundamental level, tourism to the country raises important ethical considerations. As the Washington Post notes, the crux of the dilemma rests on economics. For one, a visit to the North is expensive and all of the money spent to enter the country goes straight to the cash-starved regime. Beyond this, the Washington Post notes another issue, as observed by B.R. Myers, a scholar who has done research in North Korea and written about it in The Cleanest Race: How North Koreans See Themselves and Why it Matters. According to Myers, when visitors to the country duly place plastic flowers as a tribute or bow before state monuments in sight of ordinary citizens, this simple act unintentionally legitimizes North Korea’s rulers in the eyes of the state’s impoverished populace. “These events are good at opening doors to future activities, building new relationships, and exposing the North Koreans to outside information,” Melvin said. “I hope they have a good time and enjoy themselves. Basketball is popular in the DPRK, and the NBA is rumored to be quite popular among Pyongyang's elite, so maybe they will surprise us." Dr. Stephan Haggard, director of the Korea-Pacific Program at the School of International Relations and Pacific Studies, University of California, San Diego, agreed with this perspective. “We should not try to fine-tune people-to-people engagement and particularly not more serious forms of exchange, such as academic and cultural ones,” he told The Diplomat. Dennis Rodman may be winning the hearts of North Korean fans, but this trip isn’t statecraft.